1. Screw Location with 124 tiny cells, can place and secure 124 different screws in order. 2. Resistance to high temperature of 530℃. 3. Several hole location to set screws, IC chips and small parts. 4. Only some small section is magnetic(marked on the pad),can be used to hold screws firmly. It is a bit weak, NOT so strong magnetic. Note: The pad may have dust or other appearance minor defect.It does not affect the function.Please make sure that you don't care that.Thank you. MULTI-FUNCTION : Silicone Pad Structures With a Circuit Board Location, A Screw Location, 3 Parts Compartments with Covers, A Magnetic Tools Area, 3 Magnetic Parts Areas, 7 Non-Magnetic Parts Areas, A Scale Ruler, And 42 Spare Cells. HIGH HEAT-RESISTANT: Resistance to High Temperatures, Heat-Resistant Air Temperature 550 ‹ , Can Well Protect Maintenance Mat, Avoid High Temperature Damage ,Reduce Poison, Beneficial to Your Health. ANTI-SLIP DESIGN: Both Surface and Back Side Are Adopting the Anti-Slip Design. It Won't Slide Around on your counter or station, and its attractive design keeps small parts away from sliding, too. The tweezers adopt anti-static design to prevent static damage to electronic components. WIDE APPLICATION: It is an ideal product for soldering electronics assembly or electronics and circuit board repair, for example mart phone, laptop, computer, sports watch, camera, smart toy, eyeglasses etc. And you also use it big pads as pot holders for pots, pans, trays, baked potatoes and more. You can even place it that is heat-resistant, non-slip on tables or counters for pots and pans. Note: It is just the Magnetic Silicone Repair Pad, It does not include any other tool! 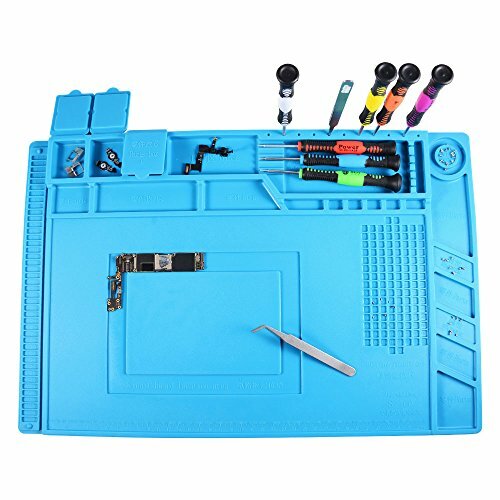 Large 11*17 inch silicone solder mat sprayed with a layer of silicone liquid on surface which is high temperature resistant and magnets no dust. And both sides of the soldering mat are anti-slip, it won't slide around on your counter or station. If you have any questions about this product by Weststar, contact us by completing and submitting the form below. If you are looking for a specif part number, please include it with your message.